These three partners each have many years of experience in art-related fields. Together they have worked more than 80 years in art reproduction, marketing, and retail custom picture framing. Also, Barry and Robin have put together an outstanding team of technicians, including skilled photographers, professional artists, graphic designers and digital imaging specialists. DAS uses the latest and best possible technology available to help its fine artist’s clients achieve superior quality, color accuracy, and consistency on every project. Color management is not only about technical expertise; it requires an artistic background and keen color sense to be able to make a winning collaboration with all artists, regardless of their technical knowledge and expertise. The company is dedicated to providing proactive resources to assist visual artists with all their sales and marketing efforts. Its FineArtMarketplace.com proves the point. It is an e-commerce website created for clients to use as their “sales portal.” Artists benefit from complete fulfillment services for print orders, payment processing, and direct shipping. Another example is it has routinely advised artists to read How to Profit from the Art Print Market. A book exclusively devoted to helping visual artists succeed in the print market. It has sponsored a live seminar with author Barney Davey and more recently a webinar with him, all in a continuing effort to educate its clientele and help them with their sale and marketing efforts. 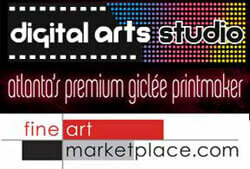 The company is a proud member of Adobe’s Print Service Provider Network. It belongs to many other professional organizations. It also sponsors numerous local and national art and photography groups. It is a premier book sponsor advertiser in the Giclee Business directory, which contains listings from more than 500 companies with products and services aimed at helping visual artists operate their art businesses more successfully.